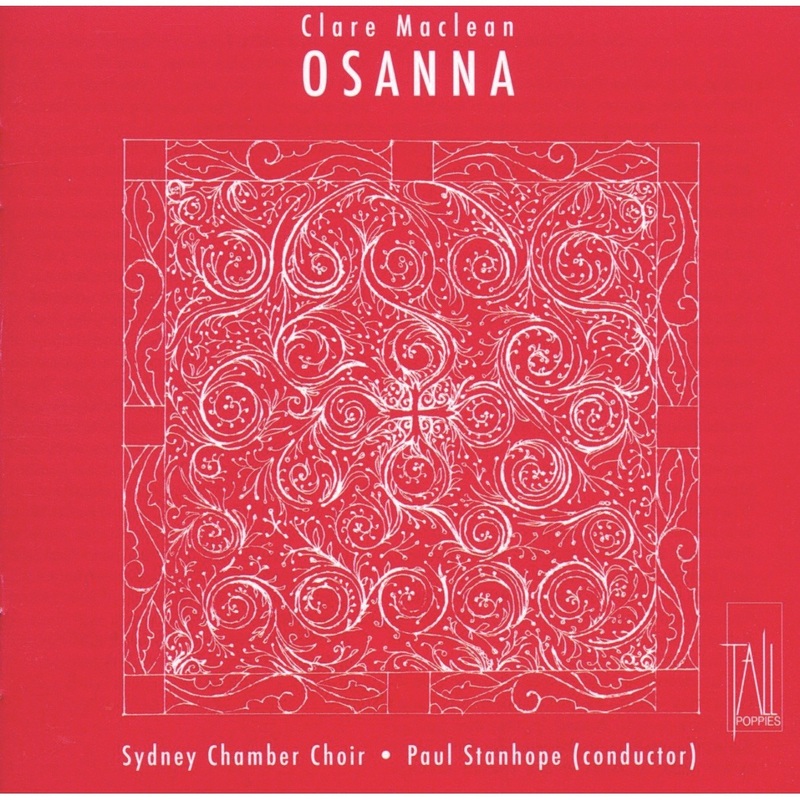 The Osanna Mass is the featured composition on the Sydney Chamber Choir’s latest CD of choral music by New Zealand born composer, Clare Maclean. The shorter works that complete this recording are beautiful miniatures: In the Year that King Uzziah Died, os anthos chorton (As the Flower of the Grace), Vive in Deo and We Welcome Summer (a setting of a poem by Michael Leunig). This recording of a cappella music boasts the many wonderful qualities of the Sydney Chamber Choir and their director, Paul Stanhope. The mass movements of the Osanna Mass are based on plainchants for the Ordinary of the mass. As in the masses from the Classical and Romantic periods, the sections of the text dictate the nature and character of each of the movements. The movements are beautifully crafted by both Maclean’s writing and the execution of Stanhope’s interpretation, to create a diverse colourful palette. The opening plainchant in the Kyrie takes the listener into the realm of the Renaissance mass, but this is rather short lived. The polyphonic lines give the illusion of the genre, but it is Maclean’s compositional language that clearly sets this as a contemporary work. The lines move from independent entities, captured nicely by the singers with much attention to the contour of the line and to the sensitivity of the text, into shimmering clusters. Maclean uses a wide range of compositional techniques, which add to the captivating nature of this work as a whole. The Gloria sets us a series of repetitive ostinato sections, which emerge into minimalistic pools of sound. The ambiguity between major and minor tonality as a tool to build up the texture of a section is combined with bell-like precision and, although rather seldom in occurence, homophonic sections show off the richness in the blend of the ensemble. Part of the unique nature of this Osanna Mass is its inclusion of elements of the Jewish liturgy. The Kyrie uses a traditional setting of the text for Kol Nidrei, a prayer of renunciation of vows made and not kept. The Gloria uses a setting of the Aleinu from the Jewish morning prayers. The melody of the Sanctus, although from the Kyriale IX, resembles the Aleinu melody. The Sanctus is particularly stunning in its opening section and once again we witness the crystal-clear intonation of the Sydney Chamber Choir. There is a fluidity in this movement as the voices ebb and flow in the mirage of sound. The intonation is impeccable throughout this recording. The opening section between the upper two voices of the ensemble perfectly illustrates this. The clear colour of the upper voices mixes with the richness of the lower voices to display all the different timbral qualities of this work. 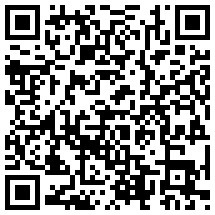 The Osanna Mass recently won the 2012 Art Music Awards in the Vocal/Choral section. The Art Music Awards are presented by the Australasian Performing Right Association (APRA) and the Australian Music Centre each year. The other four works on this recording are a sample of Maclean’s earlier music. In the year that King Uzziah died (2003) is a setting of Isaiah’s vision of God, and stretches the polarity of the outer voices of the ensemble, with sopranos delivering exquisite tone. Os anthos chortour (2004) employs a mixture of minor and octatonic modes and stands out on this recording due to its rhythmic vigour. We Welcome Summer (1996) sets a poem from Micheal Leunig’s The Prayer Tree. The unique poetry and music celebrate qualities of the strong light of the Australian Summer. 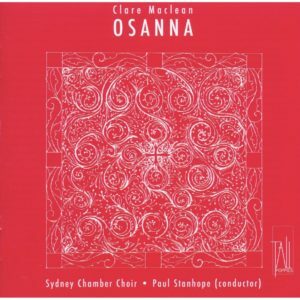 A significant voice in Australian choral music, the Sydney Chamber Choir, of which Maclean was a member, has produced a recording that needs to be listened to. 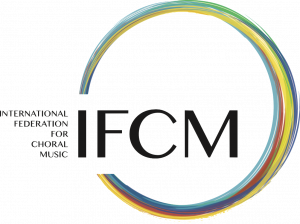 It provides the international singing community with a sample of the diverse and superbly striking Australian choral music scene. Interview with Jake Runestad: When the Text Always Comes First!